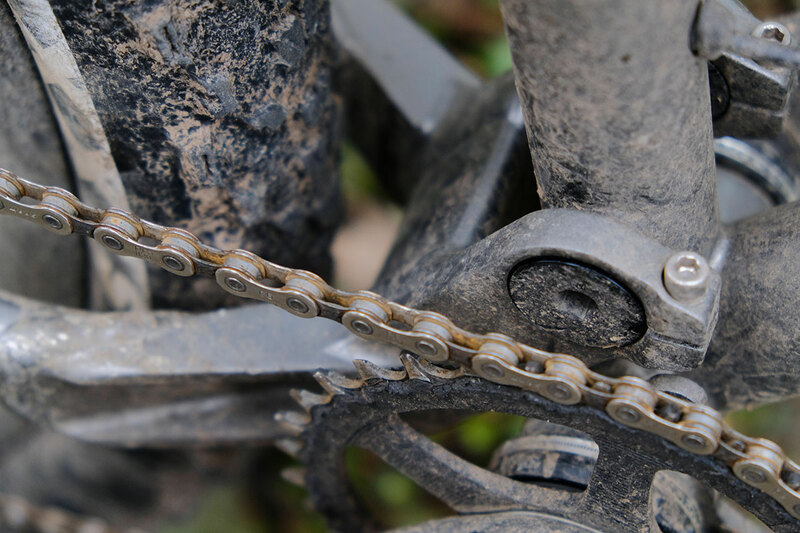 Being one of those mountain bikers who prefers to ride bikes than maintain and clean them, and living in one of the wettest places in the country, the idea of a chain that doesn’t rust is perhaps the holy grail of bike componentry. So it was with some enthusiasm that I took on the challenge of turning a chain with ‘maximum rust resistance’, err, rusty. Long story short: I failed. The KMC X11 EPT chain comes with a new EcoProteq treatment, which the manufacturer claims has double the rust resistance of its previous RustBuster treatment, 650 hours of salt spray resistance (that’s a lot of winter road riding! ), and some other benefits such as less noise and a more subtle look. Don’t run 11-speed? 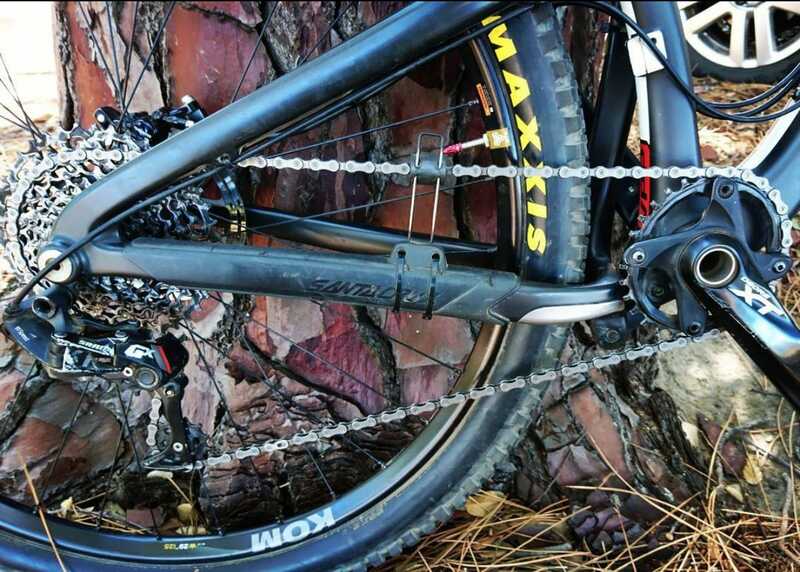 You can also get the EPT chain in 1, 8, 9 and 10 speed versions, and there’s even e-bike specific chain options too. An anti-rust chain for use in one of the wettest parts of the UK? Sounds like a challenge. 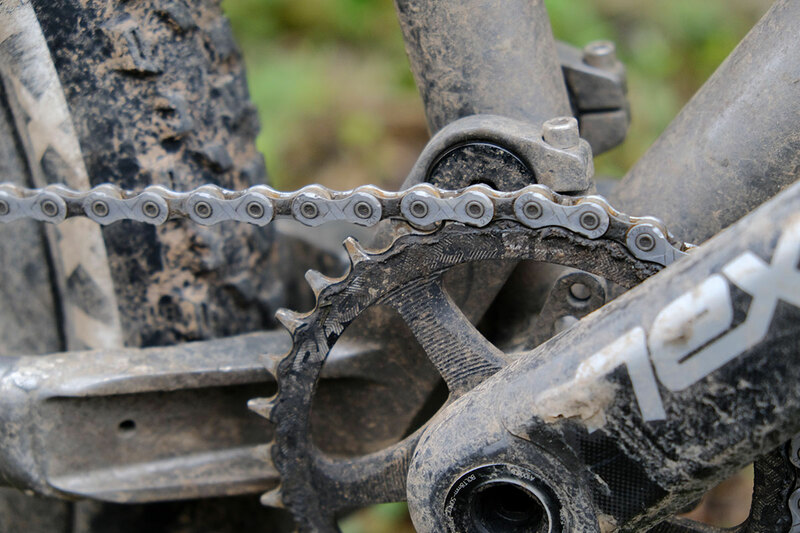 With the goal of showcasing its clever new treatment, KMC’s UK distributor, Moore Large, sent us out an 11-speed chain that was made up of one half a KMC X11 EPT chain, and another half from another ‘popular drivetrain brand’. This other half was a bog-standard untreated chain, with the idea being that we could evaluate the condition of each half over time to see just how anti-rusty the KMC bit would be. And so from there, all I had to do was to seek out the filth wherever I could find it. The Calderdale spring/summer(?) did not disappoint on this score, but it soon became apparent that simply going on normal wet rides wasn’t going to be enough. Thanks to my laziness, it’s not uncommon for me to come back from a night ride and throw the bike in the garage as-is, and come back to it a few days later to find an orange chain. Add to that some deliberate non-lubing, and we had the perfect chain-busting regime. The KMC X11 EPT chain features a special anti-rust treatment that boasts 100% more protection than its previous coating. A few weeks of abuse later and the differences between the two chains became apparent. The untreated half would immediately turn orange after being left uncleaned and un-lubed, whereas the treated KMC half showed no real difference. Although as you would expect, a quick clean and application of lube restored the non-treated half to normal working order and appearance. There also appeared to be no drop in performance, with the chain remaining smooth running and shifting as long as a modicum of lubrication was employed. The EcoProteq coating seemed to be working, but for how long? Again the Calderdale autumn did not disappoint. The hopes for Indian Summer didn’t materialise and more wet rides and lazy maintenance ensued. The coated half of the chain is still pretty much as it was when first unwrapped. The uncoated half is beginning to look, well, like a four-month old chain that hasn’t been looked after. Because that half is so rusty, it has started flaking orange bits onto the cassette and chainrings, which is why you can see a few flecks of orange on the KMC half – just in case you were wondering. The other half of the chain is going a peculiar (and familiar) shade of orange. The only negative I can think of is the appearance. The coating gives it a matt grey/silver appearance, so shiny bling this is not. You won’t turn any heads at the trail centre with this, but then that if your riding peers are known for turning heads at chains, that might say more about them than anything else. All up, the KMC X11 EPT chain did exactly as advertised, even with my deliberate neglect. That said, our experiment really only showed its performance against a £19 untreated chain, but it’s still a good example of what the EPT treatment can do – even after 800km of punishment. If you’re the obsessive maintenance type who’s handy with a rag and a bottle of lube, and enjoys spending time at the end of a group night ride cleaning and detailing things, then the extra £15 might be better spent in the pub – assuming you make it back before last orders. If you’re from the ‘I’ll sort it out tomorrow’ brigade like me, then the extra expense for the KMC X11 EPT chain may well be worth it. Exclusive! 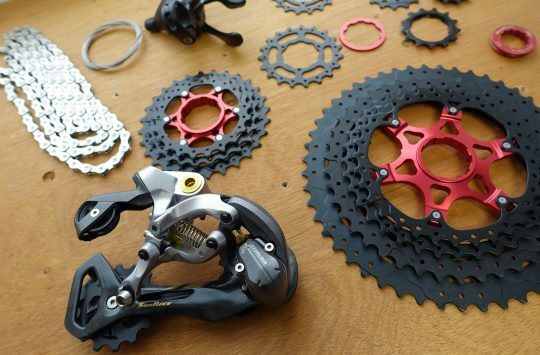 New 1×12 Drivetrain From SunRace! Did the two parts wear differently? Or is a purely aesthetic advantage? Well the rust has to come from somewhere so you’d think there did have to be more wear on the untreated chain. Yeah, but any functional wear is going to be inside the rollers rather than on the surface of the chain. Could they not see if a chain-wear checker shows any difference between the two rather than just seeing if there’s surface rust? Frankly I don’t think lubing a chain regularly is a big deal, certainly not the OCD process the review makes it out to be, but each to their own. Exactly BWD – a good comparison of rusting but what really matters is wear. 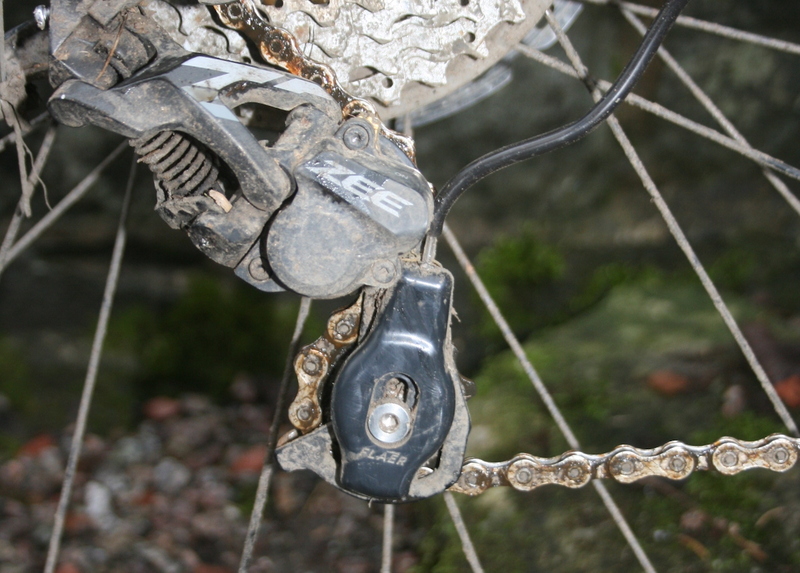 A thorough review would have compared the wear of the two chain types. But then if the comparison chain cost £19 and the EPT £35 it’s going to have to last 80% longer to justify the cost, Because you still need to lube it and therefore most likely wipe it which will deal with any rust. That would be good dazh – although I get around 400 miles (in Calderdale mainly) from my 11 speed KMC 11-93’s are at 0.5% wear, which is the recommended point to change an 11 speed chain. If you’ve done 800km, best check yours ? @BadlyWiredDog – Absolutely, though it’s worth pointing out that surface rust will have an impact on the wear of other drivetrain components aside from just the chain. The more of the chain’s surface that turns to rust, the more grimy, metallic-y grease you’ll have build up on your chain. And that grimy paste is going to be like sandpaper on the cassette sprockets, jockey wheels and chainring teeth. That’s assuming you don’t thoroughly clean and lubricate your chain on a regularly basis, which is exactly the market that this KMC chain is aiming for. On top of that, a chain that eliminates rust build-up is also going to reduce the potential for shifting/chainsuck/derailment issues too. @steel4reel As mentioned in the article, I’m an extremely lazy mechanic. I’m certainly not disciplined enough to change my chain every 400 miles, and I can’t really see the point. Better to grind an entire drive train down and then replace the whole lot if you ask me. It’s not something I measure, but I reckon I’ve had at least 2000 miles out of one drive train (must’ve been a dry year!). On my road bike I’ve managed something like 10000 miles before I had to change anything. Would you be able to use a chain checking tool on the two halves and evaluate whether there is any real difference in the wear (“stretch”) of the chain? Otherwise it’s just really aesthetics. As a mechanic, you “I will simply ride it to the ground” guys always make me wanna cry. Sure, technically the chain might stay on and sort of “work”, but the difference in actual function between a well-maintained drivetrain and yours is monumental. Shifting performance especially will be seriously downgraded, and the chance of nut-cracking mishaps increases with every km over 1000-1500. You do know that worn chains break way more easily than ones replaced in time? 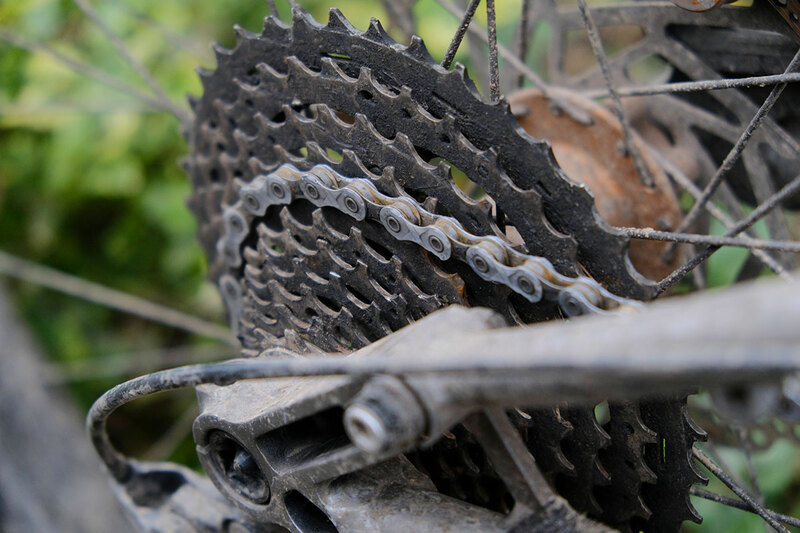 It is not only for the wear on the cogs that they need to be replaced in time – for a fun science experiment, take apart one of your 2000 miles chains, and see for yourself how much thinner the pins are…. Safety is a large reason for chain replacement. But hey, it is not my nuts on the line! I live in Northern Minnesota, USA. Our roads our heavily salted in winter (November-April), and we get regular snowfalls. Together this means our roads are basically a salt bath for 5 months of the year. My kids and I ride our fatbikes to school (almost) every day of the week. I have found these chains to work extremely well. They last way longer on this horrible encoring met than you think they would, even with minimal maintainance. This is comparing to other decent quality chains, not just to a basic one.